"Rock & Bike 2018 - Incredible!" My first festival and boy, did I hit the jackpot!! From the fantastic, professional organisation, cleanliness of site, ample facilities and great layout to the superb arena and catering & bar arrangements! And the bands were superb! Whilst not hugely into rock, I am into live music and none of the bands failed to impress! Equally, there was superb diversity in the acts, from the highly entertaining 'Surreal Panther' (you will wet yourself!) to the brilliant 'Big County' (my era). And who would have thought the magnificent tribute act 'Fleetwood Bac' would have ended the weekend with several thousand, predominantly hairy ar*ed bikers singing their hearts out to 'Go Tour Own Way'...?! And whilst perhaps slightly before my time, 'Lindisfarne' were superb - I've never seen so many people dancing...! "brilliant amazing bands and very relaxing atmosphere will going next year cant wait x"
Rock n Bike fest is really well run. Its in a perfect location close to Alfreton if you need anything. Always a great mix of bands. The custom bike show is fab and the catering is a good mix, and unlike other festivals the prices are reasonable. You also have the option of takung your own drink in as long as it is in a plastic cup or bottle. This obviously keeps spending costs down. Saying that the bar prices are excellent. My only complaint is tbere are not enough toilets in the camosite to cater for its size. Other than that this is a brilliant family friendly , well run festival which I return to every year. Love it. 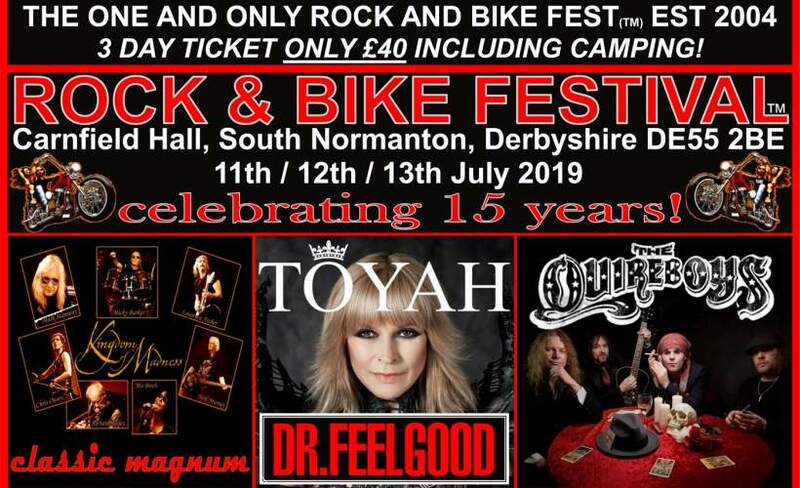 "I loved all of it - my first time at this event, but I'll be back"
ROCKANDBIKEFESTIVAL is on sale with Gigantic - the best place to get tickets for all your favourite festivals. We are excited to be selling ROCKANDBIKEFESTIVAL tickets, but we must make you aware that they are selling very fast and in high demand so book yours before they are all snatched up!! Plus many more bands to be announced including some international artists over Thursday , Friday & Saturday.